Pulse-start metal halide lamps, fixtures, and ballasts are well worth the initially higher front-end costs they present to both you and to your clients. The improved efficiency and performance generates a superior light source and reduces energy costs that translate down the line to a return on investment. Pulse-start metal halides also last a great deal longer than their probe-start standard equivalents. This represents even more savings you can pass on to your client because replacing standard MH fixtures represents both equipment costs and labor costs your clients simply do not want to pay in times of a recession. 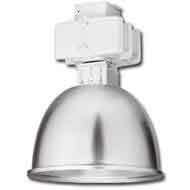 Pulse-Start Metal Halide HID Lighting Fixtures. Pulse-start metal halides, like their standard predecessors, fall into the category of High-Intensity Discharge lamps, also known as HID lamps. On the average, a standard HID lamp performs with approximately 3 times the efficiency as an incandescent lamp. Even better results can be expected with pulse-start MH fixtures, which in spite of their approximately 20% higher front-end cost, more than pay for themselves over the course of a lifespan. While standard Metal Halides lead many sectors of the site lighting industry in the arena of LPW, it may very well serve both you and your clients to increase this efficiency by up to 24% by investing in pulse-start metal halides. This may constitute the winning element of your bid if you are proposing an area lighting system in a major city such as Houston, TX where LPW efficiency regulations have recently changed to 1 lumen per .05 watts. The power savings, plus the increased lighting output, could potentially represent an irresistible line item on your next proposal. Higher light output per unit of electric power Pulse-start lamps produce more mean lumens per watt of electricity. Pulse-start metal halides offer further competitive advantage over standard MH lamps by increasing lumens maintenance by as much as 15%. As standard HIDs age, they actually output less light. To compensate for this phenomenon, known as lumen depreciation, contractors will often slightly oversell the number of lamps so the overall system will maintain the desired lighting output for the duration of its lifespan. This, of course, costs the client more money. If you really want to be competitive, show your clients how pulse-start metal halides are 6-15% better at reducing lumens depreciation—then show them a photometric study with fewer fixtures (and less costs) than your competitors’ proposals contain. 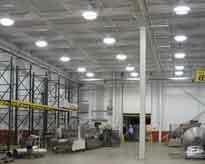 Many of the latest, US-manufactured pulse-start metal halide lamps can last as long as 15,000 hours. This is 5,000 hours longer than the estimated 10,000-hour lifespan of a probe-start lamp of the same wattage. Sell your clients not only on the idea of a longer lasting light source but on the money they will avoid spending on expensive labor fees to replace burned out lamps. As MH lamps get older, their CRI depreciates as well. Pulse-start MH lamps, however, maintain a consistently higher CRI than probe-start equivalents. They also take only 2 minutes to warm up, and in the event of a power failure, normally re-strike in 4 or 5 minutes—much better for security lighting than standard MH lamps that take around 12 minutes to re-strike. Every contractor knows it is generally not a good idea to mix newer technology with older technology. Pulse-start lamps should be fitted to pulse-start fixtures and operated with electronic ballasts for maximum energy savings. Since your clients will be spending more money on the equipment itself, it will be necessary to show them some math to justify the added expense, and to promise them a return on investment. RLLD Commercial Lighting will help you do this in a number of ways. First, we will help you determine just how much power your client will be saving and estimate an adjustment in their lighting bill. We can also estimate a reduction in labor costs associated with replacements if your client will provide us with previous expenses paid along these lines. Last, and most importantly, we will give you a free photometric analysis of your client’s site showing the exact nature, number and position of your pulse-start metal halide fixtures. This directly relates to a previous point we made about other contractors overselling fixtures to compensate for lumen depreciation. With our advanced lighting design software, we can publish a schematic you can hand to your client that proves how less is literally more. All pulse-start metal halide fixtures, ballasts, and lamps are made here in the United States by leading HID manufacturers.RLLD Commercial Lighting is a full-service lighting design and domestic equipment vendor offering complimentary design support to all clients who make a purchase and adjunct design services for a reasonable fee to information seekers.